Welcome to Joliet Municipal Employees Federal Credit Union! 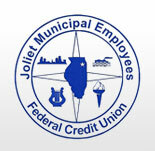 Welcome to Joliet Municipal Employees Federal Credit Union, where our members are our most important asset! Joliet Municipal Employees Federal Credit Union is committed to providing quality products and services to help our members meet their financial goals. Service is our top priority; we are small enough to give you that personal, home-town banking touch. Joliet Municipal Employees Federal Credit Union was chartered September 17,1964 to serve the City of Joliet employees. We are open to City employees and their families. Credit unions are member-owned, member-governed cooperative movement. Credit unions are guided by a Board of Directors, which is elected by the membership. Each member has an equal voting right. Unlike banks, credit unions return their profits to their members in the form of better rates and additional services. We offer many of the same services as a bank, many times at a more competitive rate. We strive to become your primary financial institution. Federal Deposit Insurance up to $250,000 by the NCUA. Our Credit Union maintains sound business practices and a safe secure financial network where members can be assured that their personal information is protected. Become a member today and see what benefits Joliet Municipal Employees Federal Credit Union can offer you!